Marijuana growing expert and hydroponics pioneer Michael Straumietis and his Holiday Heroes team. Hydroponics nutrients pioneer Michael Straumietis is known worldwide as a symbol of massive success in the marijuana industry. Starting as a clandestine, large-scale cannabis grower at a time when growing was much riskier than it is today, he realized that marijuana plants would grow and yield better if they were fed specialized nutrients and supplements. Straumietis realized he had to create his own hydroponics nutrients company, Advanced Nutrients. Today Advanced Nutrients is internationally acknowledged as the designer and manufacturer of the only fertilizers crafted for connoisseur cannabis. That’s why Straumietis is on the cover of marijuana magazines, and business magazines. 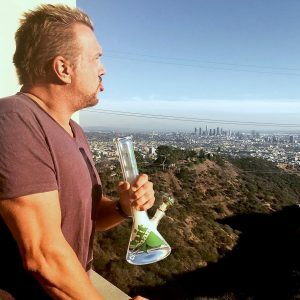 He hosts after-parties at major music events, where the top music stars and Hollywood celebs sample superb cannabis whole flower and concentrate produced by growers who use Advanced Nutrients products. Straumietis lives in a multi-million dollar mansion overlooking Los Angeles… a mansion reported on in major media because it’s the site for Straumietis’ high-end legalized cannabis industry events, lavish parties, and cannabusiness networking. But there’s another side to this famous, fearless, flamboyant marijuana entrepreneur and advocate–philanthropy. Take for example this past easter weekend, when Straumietis led a team of Advanced Nutrients colleagues and volunteers for his “Holiday Heroes LA” charity. First, they stuffed 2,000 backpacks with “street survival supplies” including clothing, toiletries, and food. Then they gave those backpacks to hundreds of homeless, disabled, struggling Los Angelenos. Straumietis and Holiday Heroes LA did the same thing last year at Christmas. Straumietis also has a European Holiday Heroes organization that’s helped 30,000 disadvantaged families. Straumietis says philanthropy has always been part of his business and personal models. One of his earliest public service projects was helping medically-disabled Canadians who qualified for federal government marijuana growers licenses. “They had the legal right to grow marijuana medicine, but were too sick to do it. They didn’t have enough money to buy hydroponics equipment. They lacked cultivation knowledge marijuana growers need. Advanced Nutrients helped them build and run their first grow rooms,” he said. Advanced Nutrients donated tens of thousands of dollars worth of grow room equipment, hydroponics nutrients, horticulture training, cannabis cultivation assistance, and operating subsidies to grower-patients, he says. Donate some of your trim or inferior buds to a dispensary or other organization that gives cannabis to people who can’t afford to buy it. Offer lower per-gram prices to people on fixed incomes or who are otherwise struggling financially. If you hire grow helpers and/or harvest helpers, treat them with respect, pay them on time, give them bonuses. Volunteer for a community organization. “Snoop Dogg is a youth football coach,” Straumietis says. “Marijuana growers don’t have to hide in their grow house. They can help the community. Be a mentor. “You can be generous with your time and knowledge. Teach younger marijuana growers how to grow better,” Straumietis says.